On November 12, Charge d'Affaires a.i. 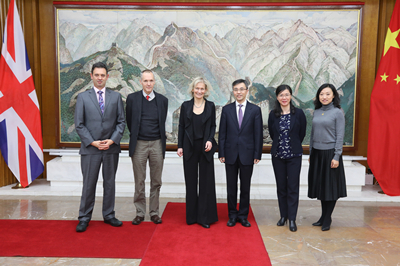 Zhu Qin met with Zanny Minton Beddoes, Editor of The Economist, at the Chinese Embassy. Zhu noted that The Economist has paid increasing attention to China’s development in recent years and has expanded its coverage on China’s politics, economy, society and people's livelihood. In September this year, it launched Chaguan, a new editorial column on China. He hoped that The Economist would report on China in a fair, objective and comprehensive manner and present to its readers a true picture of China. Minton Beddoes said that The Economist attaches great importance to reporting on China, having expanded its China-related reports by 50%. In the future, The Economist will strive to report on China more comprehensively and objectively so as to offer a balanced view on China and China’s development to its readers. The two also exchanged views on Brexit and the China-US trade dispute.